More sad news as another music legend passes. EDDIE BO passed away on March 18th 2009. 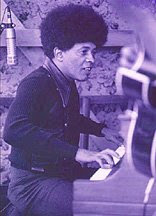 Edwin Joseph Bocage (September 20th 1930 – March 18th 2009) was an American singer and New Orleans-style pianist. Schooled in jazz, he was known for his blues, soul and funk recordings, compositions, productions and arrangements. He debuted on Ace Records in 1955 and released more single records than anyone else in New Orleans other than Fats Domino. Break fiends will no doubt know him best for "Hook & Sling" - a B-Boy classic and dancefloor filler.